The Tournament 3000 table is a professional style table for the serious foosers out there. As the name implies, this table is definitely suited for a tournament play, but built for home use without the coin-operated ball return. 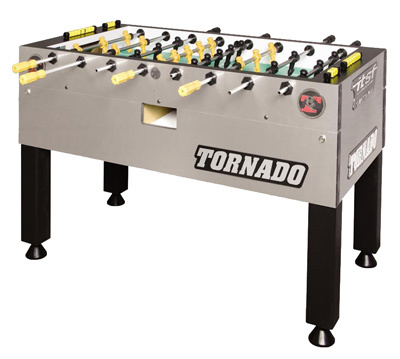 The 3000 has all of the Tornado high-end parts from the lightweight foosball rods, counterbalanced men, adjustable leg levelers to the sturdy cabinet design. Since this table has all of the best features we look for when reviewing a table, the Tournament 3000 was awarded our best American foosball table. To learn more about what parts you want to look for when purchasing a foosball table, please visit our foosball table features section. This foosball table is priced at around $1,900 US.